Husky aggression is not a trait that is common found in this breed. Nevertheless, a dog of any breed, including a husky can become aggressive from a number of factors. It may be a dominance related issue, where your husky is trying to dominate you. It could also be a trigger from a past event that was never properly dealt with, such as an attack from another dog. Regardless of what the cause was, aggression must be dealt with sooner rather than later as the prolonged results can be serious and dangerous. Husky aggression can begin at an age as young as 6 weeks. During this crucial age, the husky should be socialized with other dogs and given proper bite inhibition training in order to prevent biting in the future. The period of socialization generally lasts until 14 weeks of age, although it can extend beyond that age. A puppy should never be taken away from his litter before 8 weeks of age. Treat the puppy very gently between the ages of 8-10 weeks. Any hitting, yelling or other forms of harsh punishment can result in aggression in the future. In order to prevent future aggression, huskies should be socialized by the time they are 14 weeks old. There are a number of triggers for actual aggression, including heredity and genetics. The temperament of each husky differs depending on the individual. Unfixed huskies are also more prone to aggressive tendencies than spayed/neutered ones. The most important factor in formation of husky aggression is probably environment. If a husky was brought up with poor living conditions, harsh owners, lack of socialization, was previously frightened/attacked by another dog, then he can become aggressive as he ages. One other cause of husky aggression is the need to establish a pecking order. Signs of a husky testing for dominance are biting, posturing and other similar behaviors. Dominance must be established at a young age so that the husky does not try to rule the household when he gets older. 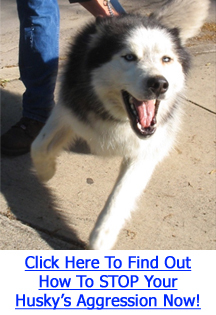 Click Here To Discover How To STOP Your Husky’s Aggression Problems For GOOD! Husky aggression that is exhibited after 14 months of age, or when sexual maturity has been reached needs to be addressed immediately. Be sure to always establish yourself as pack leader, and never reward your husky for aggressive behavior. It helps immensely to train your husky to respond to commands, to schedule feeding and walking times, and to make sure there’s a strong leader in the house. Remember that allowing your husky to take liberties will only cause him to exhibit stronger aggression towards others. If your husky is defensive-aggressive, he may strike out at a person out of fear. This means he has not been socialized properly and you should keep him away from children, who may appear as direct threats to dogs such as these. Attend a training session or consult a behaviorist who can help to acclimatize your husky to a social atmosphere. Rest assured that husky aggression can be controlled, even in older huskies. If the aggression escalates to violence, then consider hiring a professional trainer to intervene before someone gets hurt. The last thing you want is your husky to be held responsible.